Little Women at the Jungle Theater is a delightfully reverent new adaptation of the beloved Louisa May Alcott classic novel and perfect for a family night out at the theater. The casting is pitch-perfect, particularly C. Michael Menge (Jo March) and Megan Burns (Amy March) who infuse their characters with energy and passion. A special shout out goes to Wendy Lehr who is adorable in her three roles as the cranky, opinionated Hannah, Mrs. Moffat and Aunt March. This is not a dry, timid interpretation of a classic novel, but is instead filled with vitality, tears, cheekiness and many, many laughs. As the play’s director and Jungle Theater’s artistic director Sarah Rasmussen said during her preview night introduction, the play’s themes are also surprisingly relevant and timeless for a book published in the 1860s; posing the question of how forward-thinking women (and men) find a place in a society determined to force them into certain roles and expectations. Alcott’s women fight mightily to live authentically and stay true to themselves. 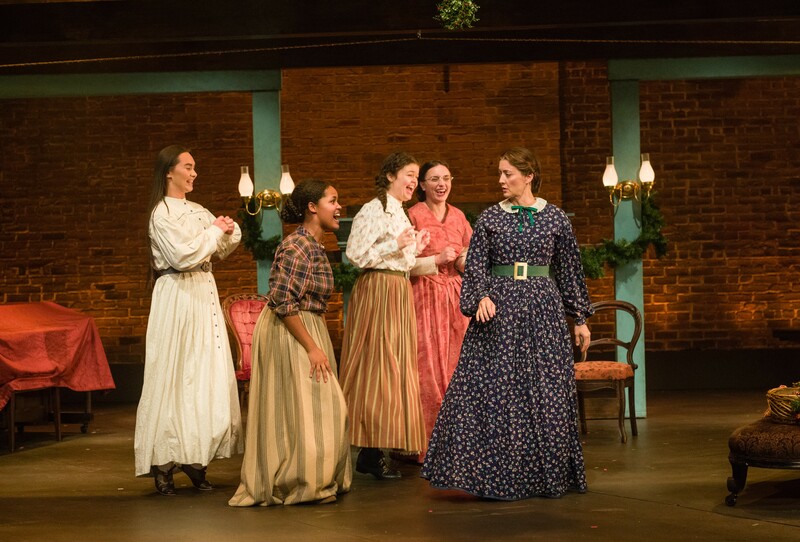 The story is well known and the play follows a condensed timeline of the book as the four March sisters—Jo, Amy, Meg (Christine Weber) and Beth (Isabella Star Lablanc) —and their mother (Christina Baldwin), whom they call “Marmee,” adjust to life while their father is away serving as a Civil War chaplain. The women must contribute to the family income through employment, which they tolerate to varying degrees. Beth is house-ridden by poor health and acts as the family conscious and cheerleader. Marmee is the moral compass of the family and soothes Jo’s frequent bursts of temper and Amy’s diva tantrums. The play focuses mostly on Jo and her friendship with neighbor and best friend, Theodore “Laurie” Laurence (Michael Hanna). They navigate adolescence, new adulthood and family expectations as they plan a Christmas pageant and their futures. Meanwhile, Meg’s marriage and their father’s illness throw the family dynamics into a tailspin. Weber as Meg has one of the most poignant and funniest monologues of the play as she details her exhaustion at being a wife and mother to twin infants. Rasmussen and Movement director Jim Lichtscheidl make the most of scene transitions and the rotating stage to energize the plot. In short, the play is a must-see for fans of the book. Newcomers will fall in love with the March family as have millions of us. This is a Jungle Theater-commissioned world premiere adaptation by celebrated playwright Kate Hamill, who was named 2017’s Playwright of the Year by the Wall Street Journal. My prediction is that it will be hugely successful as it makes it way to other cities and wins over another generation of fans.